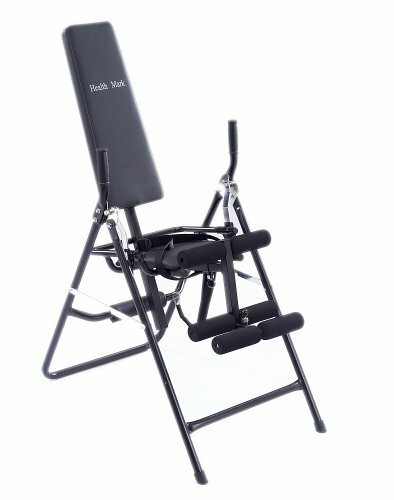 If you are looking for a sturdy inversion chair from a reputable name in the industry this a good buy; however you cannot fully invert on this chair so advanced users may want to look at a true inversion table. 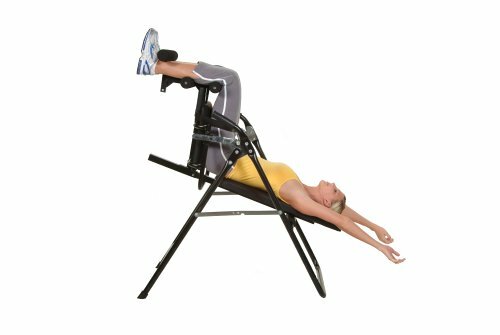 The Health Mark Pro Inversion Chair allows you to start your inversion therapy from a seated position making it different from traditional inversion tables. You still get the true benefits of inversion therapy without the stress to your ankles, knees and hips. A buckle and belt, along with an ankle/leg support device, gives you plenty of security when you have the chair tipped back. Although the maximum inversion is 70 degrees, you still gain same the inversion benefits through your back area that you would get with an inversion table. The Health Mark Pro helps alleviate pressure and decrease spinal squeezing by essentially taking a seat and lying back periodically. The standard treatments for back pain run from surgery to massage therapy to merely stretching and relaxing the shallow muscles of the spinal column. This chair used regularly will be an important addition to your treatment plan and may be all you need to avoid surgery. The daily use of the inversion chair can accomplish the following – alleviate muscle tiredness, reduce muscle spasms, decompress the spine by relieving pressure on the spine and increase your mental acuity. 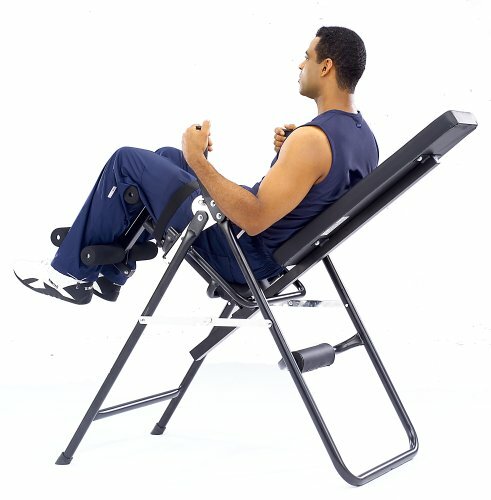 The therapeutic benefits of this inversion chair are very similar to inversion tables. The main appeal is that you are able to start your inversion from a seated position and will not be hanging from your ankles. Those with ankle or knee pain or those who have had knee surgery need this. With a traditional table you are strapped in at your ankles and upon inversion, your ankles, knees and hips feel the pull of your body’s weight. This is not the case with an inversion chair. Beginning your inversion from a seated position also allows you to feel more secure which, if you are new to inversion, may be the best way to start. You can read more about the therapeutic benefits of inversion tables here. Durable padded backrest and stainless steel frame. Bars for your hands that make the chair easy to use. Leg supports and an attached lap belt for security. Supports clients with a height range of 4 feet 8 inches to 6 feet 6 inches. Stretching is more focused on the back and not on the lower leg and ankles. Less stress on your ankles, knees and hips than with inversion tables. Easy to assemble, use and take apart if you need to be mobile. Bring the chair along with you. Heavy duty and made of high-quality materials. Easier to maneuver than a true inversion table. Health Mark Pro is an excellent manufacturer that has been around for a long time. 4.0 out of 5 stars on Amazon with over 50 reviews and 20″ questions answered. Safety belt causes tension in the hips. Parts to assemble are not properly marked. Can only invert up to 70 degrees. Need to use caution getting into the chair to avoid tipping back immediately. Free shipping is included at the time of this writing but may require 1- 2 days of processing before shipping. A one year warranty on parts and accessories is included which while adequate is not as good as the Teeter Inversion tables. You can also find our review of the Body Power Inversion chair here which is another great choice.